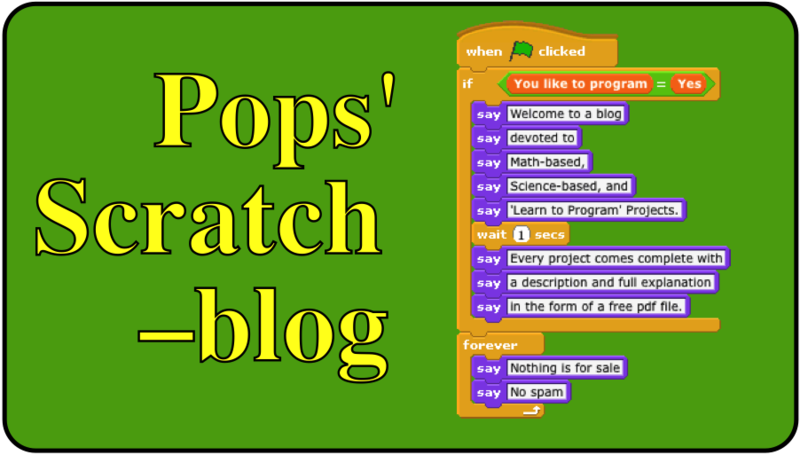 In a recent post I described the Golden Rectangle in Scratch project. To review, a Golden Rectangle is a rectangle with a length to width ratio of 1.61803… on out to an infinite number of decimal places (like Pi, Phi is an irrational number). The number 1.61803… is called the Phi, Golden Ratio, symbol (F). If, in an isosceles triangle, the ratio between the long side and the short side is 1.61803…, that is Phi, then the triangle is called a golden triangle. 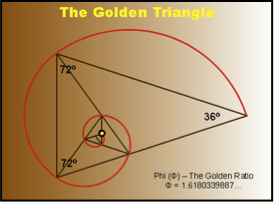 A bit of geometry and algebraic manipulation shows that the isosceles triangle with base angles of 72º and an apex angle of 36º is a golden triangle. Bisect one of the 72º angles and the result is again, a golden triangle. Half of 72º is 36º, which leaves a value of 72º for the third angle in the smaller isosceles triangle. Therefore, the smaller triangle is also a golden triangle. And so on, and so on. I love mathematics for the simple fact that even as those golden triangles get infinitesimally small, the angle values remain the same! and watch the program draw six iterations of the smaller golden triangles and then draw the spiral connecting all six of the triangles.